Flow cytometry is an important technique that has many applications and is useful in the diagnosis and classification of many disease states—in particular, hematopoietic cancers. As an important tool utilized in the diagnosis and management of cancer, it can detect minimal residual disease (MRD) consisting of only a few cells out of hundreds of thousands due to its sensitivity. This technique can be used to detect tumor cell DNA aneuploidy, analyze tumor cell proliferation, and routinely detect up to 10 parameters on single cells to immunophenotype leukemias. It can also be used to detect a high level of S phase in tumor cells, which has been found to be associated with malignancy and a poor prognosis. The International Clinical Cytometry Society (ICCS) held their 32nd Annual Clinical Cytometry Meeting in Phoenix, AZ, in October 2017. The meeting gathered clinicians ranging from laboratory directors and physicians to clinical research scientists and residents/fellows to learn about new tools, technologies, and applications for patient sample preparations, data analysis, and diagnostic classifications. 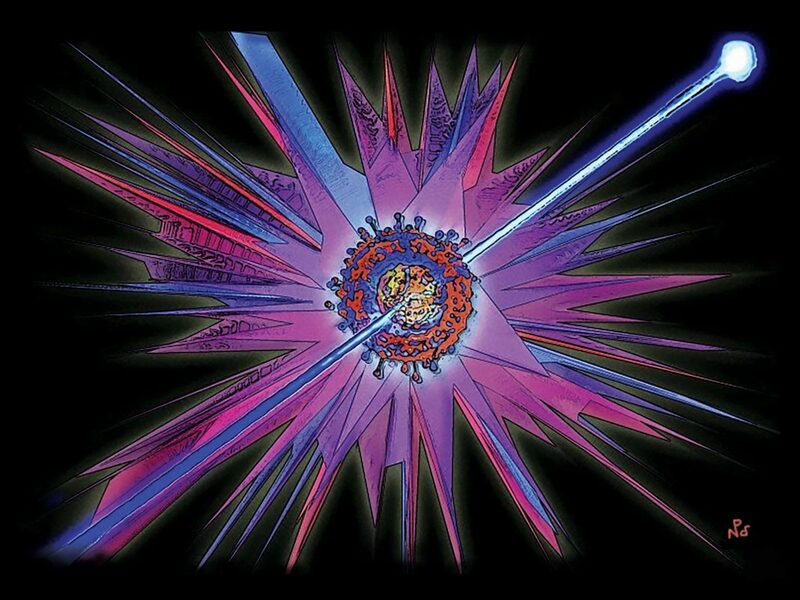 Advances in flow cytometry—with the advent of combining new lasers with multiple different wavelengths and new staining reagents with new fluorochromes—have provided the ability to simultaneously analyze several parameters on single cells at very high rates (thousands per second), making modern flow cytometry a powerful technique. The routine use of this technology in many diagnostic laboratories has grown due to these new developments and the production of user-friendly flow cytometers and flow-cytometry software. Maurice R. O’Gorman, Ph.D., who serves as the chief of laboratory medicine at the Children’s Hospital Los Angeles and is professor of pathology and pediatrics at the Keck School of Medicine at the University of Southern California, has developed, modified, and implemented several newborn screening tests employing flow cytometry. His work is primarily focused on the diagnosis, prognosis, and monitoring of immune abnormalities related to primary immunodeficiency diseases in children. “The diagnosis of some forms of primary immune deficiency, including severe combined immunodeficiency (SCID), has dramatically improved with the advent of molecular-based newborn screening, which has led to detection rates of up to 100% in states that have implemented this service,” says Dr. O’Gorman. Newborn screening, although generally successful, detects less than 10% of all known primary immunodeficiency diseases. The tests Dr. O’Gorman has developed are aimed at detecting the diseases that are missed by newborn screening. His focus has been on developing tests that can be performed routinely and reproducibly in standard clinical laboratories. His goal is to test patient’s samples in a way that mimics their normal state, which means developing whole blood tests. Routine immunophenotyping can now be performed in less than two hours using whole blood in a single tube with 6 to 10 color–detection systems. Routine immunophenotyping for the measurement of the major lymphocyte subsets is probably the most valuable screening test performed in his laboratory for the detection of immune abnormalities related not only to primary immunodeficiency disease, but also for assessing immune reconstitution following disease curative bone marrow transplantation (Figure 1). Other, more specific tests for rare immunodeficiency diseases have also been developed in Dr. O’Gorman’s laboratories, and many of these are now used as standard diagnostic tests in laboratories around the world. 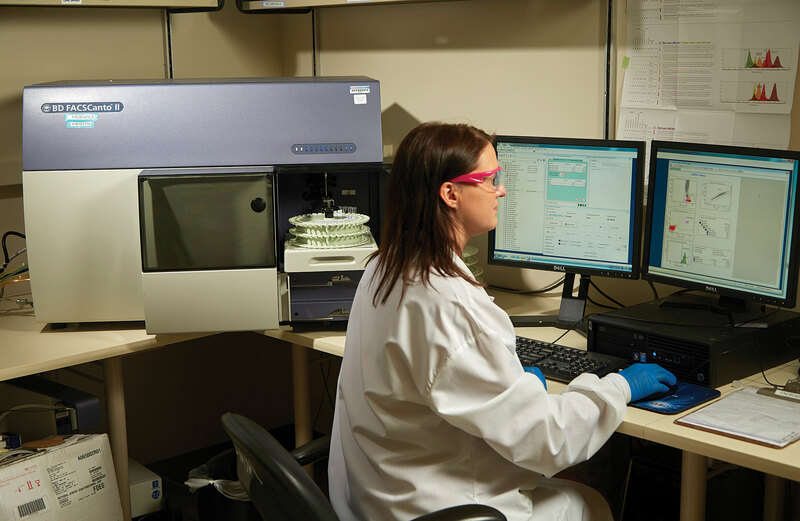 The fast turnaround time for most of these tests allows rapid diagnosis and analysis, expediting treatment decisions and providing an advantage over many other existing technologies, such as next-generation sequencing. Figure 1. Immunophenotyping in action. Pictured are the results of a rapid flow cytometry-based whole-blood diagnostic screening test for chronic granulomatous disease. The test was developed by Dr. O’Gorman at USC. The rapidity of flow tests to identify abnormalities associated with specific diseases means that at least for the present and near future, flow cytometry will remain a viable technological complement to the currently rapidly expanding adoption of genomic-based technologies in medicine, especially in the diagnosis of primary immunodeficiency disease. Vijaya Knight M.D., Ph.D., is an immunologist at National Jewish Health and serves as director of the immunology and beryllium laboratories. She uses flow cytometry in her investigation of chronic diseases, one of which is mycobacterial infection, which she evaluates along with the autoimmune response it elicits. In investigations of immune deficiency—where the patient’s immune response appears normal but there is suspicion of an autoimmune component—Dr. Knight looks for autoantibody involvement (Figure 2). If autoantibodies are being produced, it is possible they could be neutralizing key cytokines involved in the immune response. The detection of the autoantibodies that serve as indicators of autoimmune disease opens up new treatment possibilities, such as treating patients with immune-modulators (for example, a T-cell–depleting agent coupled with antibacterial drugs). Flow cytometry has helped investigate cytokine signaling pathways. Dr. Knight investigated the involvement of interferon-γ involved in cytokine signaling, which binds a receptor and causes the phosphorylation of molecules involved in downstream signaling (a reaction that can be detected using flow cytometry). Dr. Knight developed an assay where a normal human peripheral blood mononuclear cell is stimulated by a cytokine in vitro, the patient’s serum is added, and then the mixture is analyzed by flow cytometry to detect blockage of the phosphorylation signal involved in the pathway. This not only you tells one that a patient’s serum has the autoantibody, but also that it is active. These tests are offered for patient diagnosis in Dr. Knight’s CAP/CLIA laboratory (Figures 3A and 3B). Figure 2. The IL-12/IFN-? axis plays an important role in mycobacterial infection. The IL-12/IFN-? pathways are critical for the control of infection with intracellular organisms such as mycobacteria and salmonella. 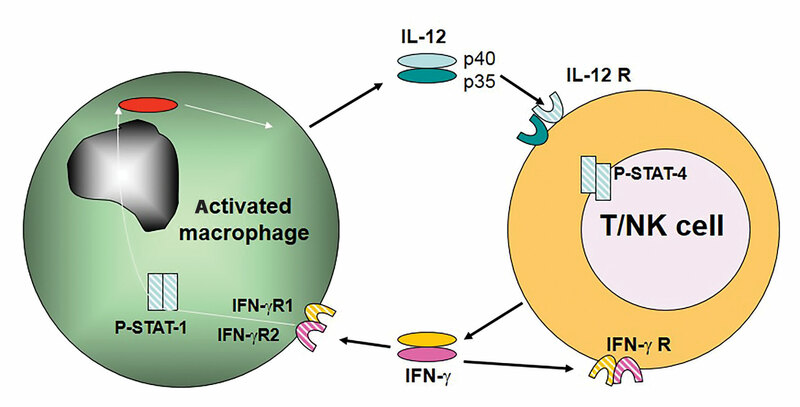 Mutations in the IL-12 receptor or cytokine, the IFN-? receptor or STAT-1 can severely impair an individual’s ability to control infections with these intracellular organisms. Courtesy of Dr. Knight. Figure 3. Functional analysis of autoantibodies to IFN-γ. (A) Neutralizing autoantibodies to IFN-γ lead to an acquired form of immune deficiency. These autoantibodies inhibit the ability of IFN-γ to signal through its cognate receptor and thereby inhibit downstream processes that lead to generation of protective responses against organisms such as mycobacteria. The use of flow cytometry in leukemia and lymphoma detection typically focuses on multiple surface markers—but the Knight lab focuses on the function of the intercellular interactions between molecules. The lab uses 3–4-color detection for the functional assays to maximize reproducibility, and primarily uses BD instrumentation, such as the Canto and the Caliber, for this purpose (Figure 4). The Canto and the Caliber comes with FDA-validated software packages. These approved software packages and robust instrument performance tracking features are important in the clinical diagnostic laboratory setting. Dr. Knight states there are other very good instruments available, but that her lab started with BD, as BD’s tools are engrained in the lab’s validated workflow. Paul Wallace, Ph.D. is a professor of oncology and is director of the department of flow and image cytometry at Roswell Park Cancer Institute. His work focuses on flow cytometry for the identification and isolation of cancer cells, and he foresees the coupling of flow cytometry with single-cell RNA-sequencing protocols to look for heterogeneity in clonal populations. The work in the flow and imaging center he heads involves immunotyping leukemias and lymphomas, HIV disease monitoring, and paroxysmal nocturnal hemoglobinuria, a rare or “ultra-orphan” disease. Leukemia and lymphoma testing in bone marrow is the main focus of Dr. Wallace’s lab, but he is also very involved in multiple myeloma. Working with the NIH, FDA, and an international consortium, he has also developed assays to detect MRD. The flow core facility headed by Dr. Wallace provides an on-demand, 24/7 service, where leukemia and lymphoma samples are processed within two hours and a diagnosis is rendered. Whether a sample is lymphoid or myeloid in origin determines the treatment course pursued, and flow cytometry plays a huge role in an early and quick diagnosis. Later, cytogenetics and immunohistochemistry can fine-tune the diagnosis, whereas morphology and other methods can take quite a bit longer. “After the patient is treated, we can go back and look for MRD and determine the continued course of treatment, if needed,” explains Dr. Wallace. The technology has advanced to the point where a bone marrow cell is stained with different antibodies with different colors, analyzed within two hours, and the result is that thousands of cells can be interrogated. “In clinical samples, you can detect 8–10 antigens per cell and realistically run at rates of 2–5,000 cells per second,” explains Dr. Wallace. “Compared to morphological analysis, the throughput is staggering, and results [can be generated that are consistent with] a very reproducible phenotype,” explains Dr. Wallace. Dr. Wallace is excited about new flow cytometers that can perform a CD34 count assay that he developed on the system. The assay, he points out, can be completed in 20 minutes. 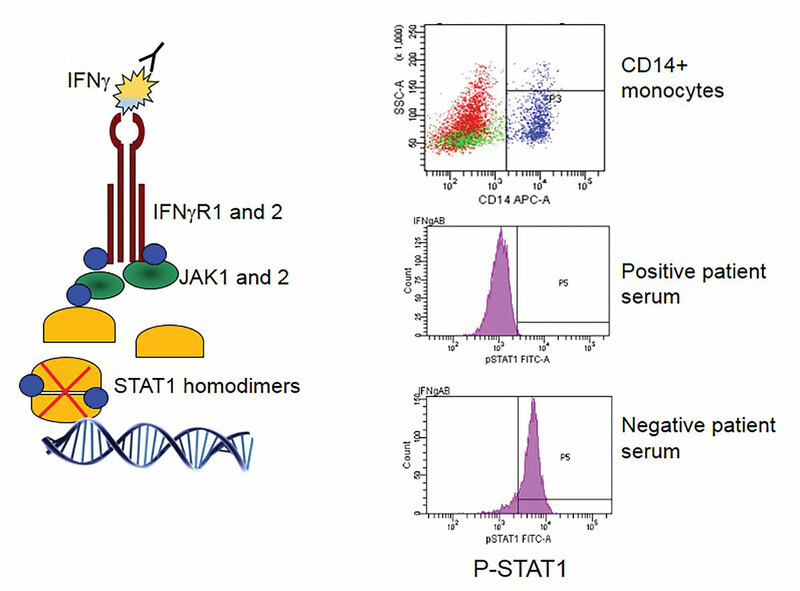 The new flow cytometry models feature automated staining, processing, and analysis and can access CD34 levels of patients undergoing treatment post-transplant. This minimizes wait time to determine if patients need to be replenished from a prior CD34-positive isolation after treatment. Ultimately, he foresees the entire flow process as something that will be become completely automated. 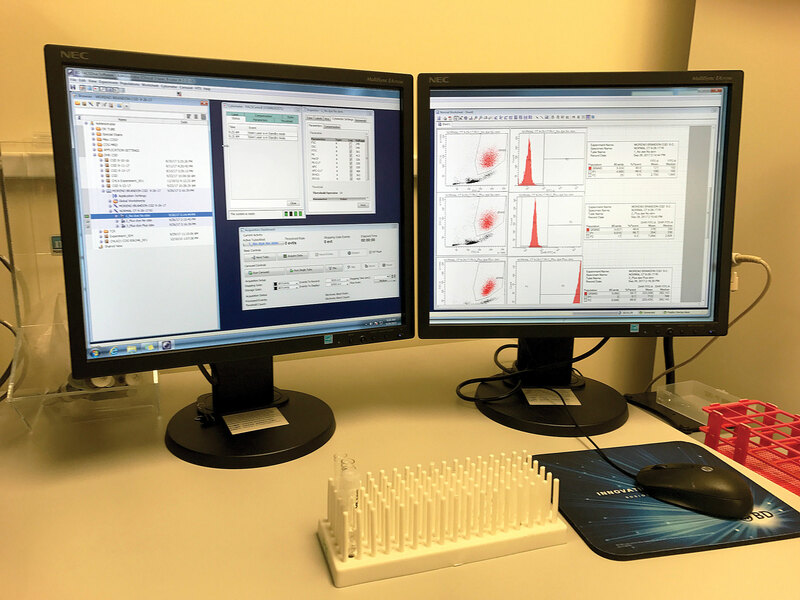 He has reduced to zero the 4–8% disparity found between individual analysis operators by training analysis software to automate the CD34 count assay. The software uses an algorithm based on probability state modeling, can handle multichannel data, and has worked well in automating the process for the Wallace lab. William Iannuccilli (Polymerase11@yahoo.com) is a published scientist with more than 25 years of academic and industrial experience in molecular biology, genomic science, instrumentation, clinical diagnostics and basic research.